I hope you have had a joyful day. The glass jars are from two candles that I bought a while ago, once the candles were no more I cleaned them, making sure all the wax had gone and put them to one side, I always keep any glass jars. First of all I masked off the edges of the jars, top and bottom, just around the rims, I just used sellotape. This can be a bit fiddly but it's worth taking time over. I smoothed over PVA glue using a sponge then sprinkled with red glitter, tapped well to get off excess. I lightly sprayed with sealant spray, this stops the glitter coming off, and put to one side. 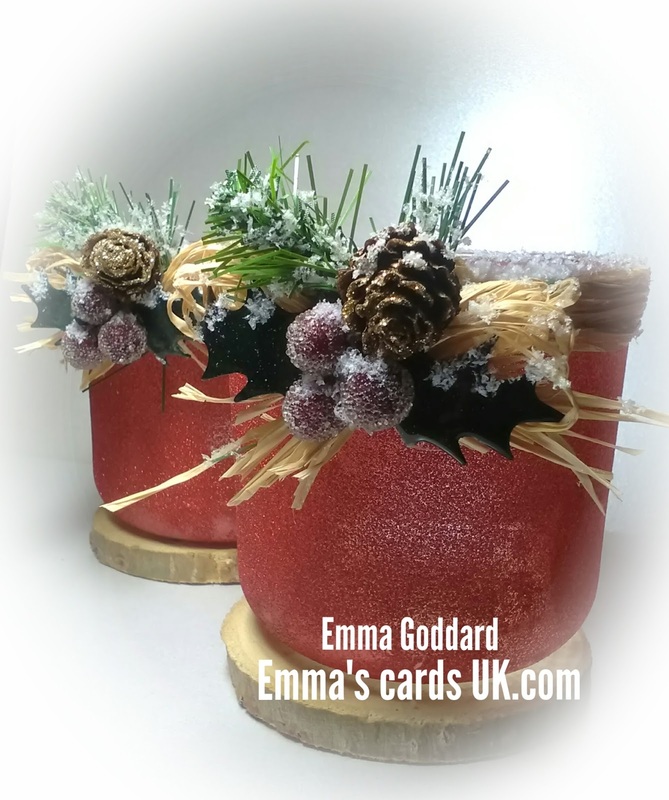 I made two raffia ribbons and made two raffia bows, I made the holly leaves by using a punch on green card, shaped them and dipped them in clear UTEE in my melt pot. I used a sprig of fern and with my glue gun I attached the raffia bow, the holly leaves, three faux berries and a glittered larch come. Using a glue gun I added the raffia ribbon around the top of the jars and added the bow embellishment where the join was. To finish it off I used white Flowersoft for snow, around the top of the jars and bits on the embellishment, basically where snow would land. These are gorgeous, love them. These are absolutely fabulous, might give these a go! !